For my project, I essentially wanted to create a project that was based on something we throw away very often, especially here in Boulder. So immediately, I thought of bottle caps! I found two upcycle ideas that I was truly torn between. 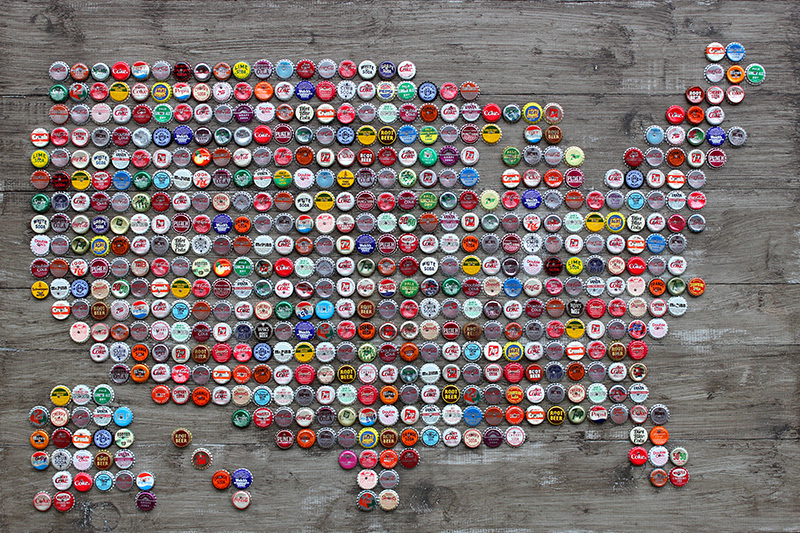 One of them was this idea of using bottle caps to create some crafts. The finished products have this raw, hipster look that I find to be both modern and vintage at the same time. 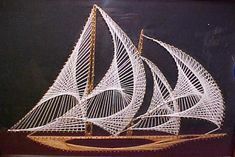 The other craft idea that I was very interested in was using thread and nails. This idea seemed to produce some very cool results. The thread adds a fairly intricate look and can be manipulated to have more or less vibrant colors. What I decided to move forward with is a combination of the two. 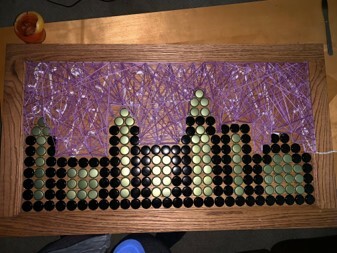 I planned on making a city skyline with bottle caps and the thread and nails method. The thread was to be used make the sky itself and the caps to construct the buildings. I also wanted to add a differentiating factor, so I thought of lights for the stars of the night sky! I wanted the project to be relatively large, about 3′ X 2′. The way my design process looks is somewhat intricate. There is a lot of iteration of steps. It starts with selecting a project through an iterative process of brainstorming and weighing options. Then I move on to expanding on my idea. What comes next is to determine what components I would like to have and how much I would like to spend, which will then indicate what materials I will be using and how big it will be. After that, I sketch some design and seek feedback on them. I will likely not need a CAD model for this project. Then I see how the components will integrate and asses my design. This is also an iterative step. Lastly, I build it and assess to see if anything needs changing. The actual process was much different and simpler. I chose materials and size first. From there, I chose a project and did a quick sketch on paper. I then expanded on my idea by adding a component, the lights. Then I went right into fabrication. The materials I used were some old thread, some nails, a hot glue gun, an old wooden frame I got from an upcycle facility, string lights I had laying around, and black and gold bottle caps. 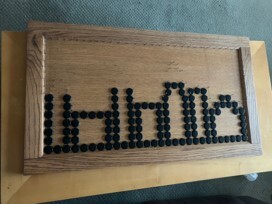 The first step in fabricating the portrait was gluing down the outline of the buildings with black bottle caps. The next step was to place nails all along the borders of the frame and the outline of the buildings. I spaced them out about a half inch apart to allow for decently thick threading. After that, I threaded the lights around the nails and tack glued portions of the wire down to keep it from protruding through the threading. Lastly, I threaded the nails with a purple thread to construct the image of the night sky. My final result came out exactly how I wanted in terms of functionality. The lights worked great and did not disturb the thread at all. In terms of my aesthetic, I would have liked the wood to be a little darker and the threading to be thicker. Also, I do not like that the wire is hanging out the front of the fame. Lastly, The bottle caps were forced to be too close to each other and there was some overlap. Moving forward, I plan on drilling a whole for the wire to feed through to the back. If i were to do this again, I would stain the wood a darker color and use a thinner thread with more loops to get a finer and denser look. 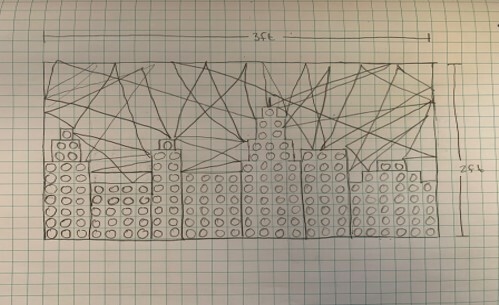 Also, I would space out the caps a little more and perhaps thread the entire outlines of the buildings, including the entire edges to separate each building a little more. I thought that this project did a great job of turning everyday materials into something that easily adds an aesthetic to any space. The complexity of the string being wound across all the nails and lights elevates the piece even more. Hi Yazen! I love the way your finished product turned out. The idea is very unique and looks so nice all put together. I like how you used a bunch of different elements with the bottle caps and the lights. Good work! I’ll be happy to help you make a good photograph of your work! Come to office hours with it, Monday at 3? Sorry i did not see this until just now! I would be happy to meet up and take a good photo of it. Unfortunately, I work after class every day except Friday. This turned out incredibly well, it looks like it could be a production prototype. The only thing I would suggest (which you brought up yourself) would be to run the lights through the board so the plug isn’t super obvious. A footswitch-toggled string of lights might be cool, too. Well done! It’s obvious that you planned the layout beforehand and doing so paid off. The idea is solid and the bottle caps are lined up well. The aesthetic is a little random, so I think your reflection about the shade of the wood and the thickness of the threading was spot on. Yazen, very cool project. I love the lights and the yarn. And then the bottle caps add a whole other aesthetic. It really shows that you put in a lot of effort and time. Hello Yazen, you did a really good job with this project! 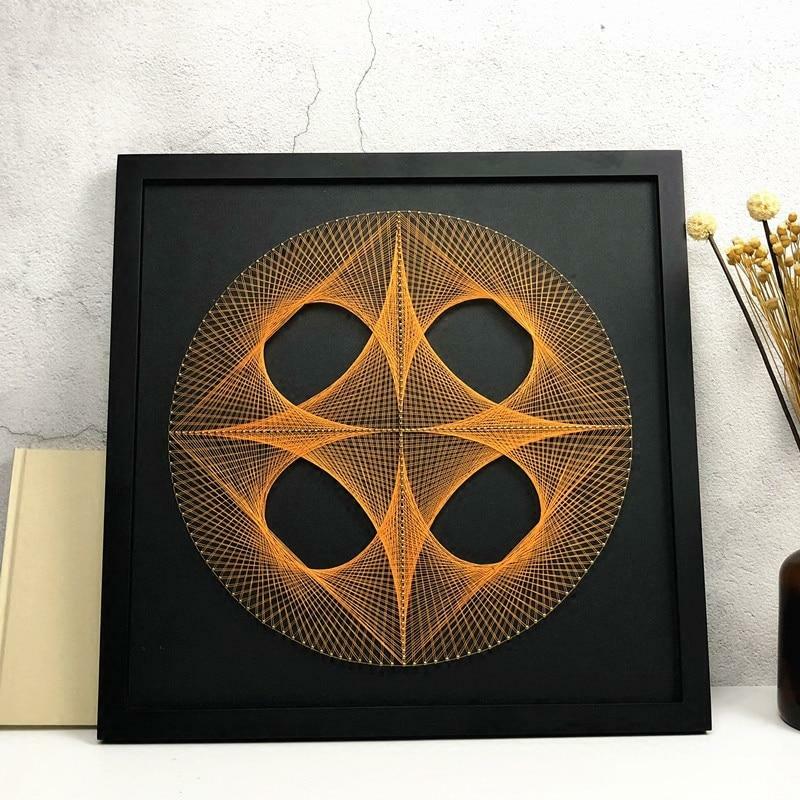 It is really cool that you were able to create a professional-looking art piece using everyday materials. The light is a great addition to the piece, you should be very prod of this it came out great! Your skyline project looks so good! I really like the gold and black bottle caps aesthetic. Seems like you went through a decent amount of yarn. The lights behind the tangle of yarn looks great! Good job! You did a great job on demonstrating the process of your design. I think the lights added a beautiful touch to the design and the aesthetic. Good job! This is an awesome project you got here! 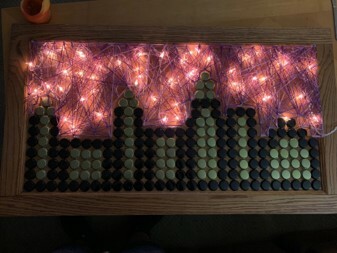 I love how creative you were with the bottle caps and then adding the lights really made the whole thing pop. Also, the amount of effort you put into it really shows because the final product looks amazing! The lighting was the cherry on top for sure. You should have put in the work though and got those bottle caps yourself, if you know what I mean. I like the CU color choice also. Adding the lights to create stars really added to the aesthetic. 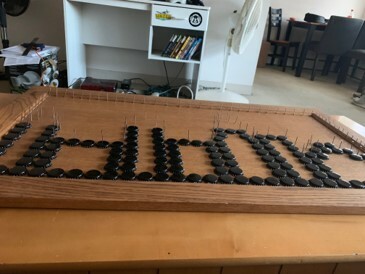 It’s nice that you used beer bottle caps for this project since so many get thrown away.